Picture 1The four known photos showing alleged rebel’s Russian Buk. From left-to-right: two made in Donetsk, one in Snizhne, and one in Torez. Note that you can click on pictures that are surrounded by a blue rectangle, and you will see either their non-cropped version or a version at a higher resolution. Picture 2The two “Paris Match” photos showing area inside Donetsk city. Paris Match published the first (top) photo on July 25, 2014. The full version of the second photo (bottom) appeared on the internet in January 2015. A French magazine named “Paris Match” published the first photo on July 25, 2014 in their online article. They showed the second photo in their July 23, 2014 article, but only as a tiny version (it is at the top of this picture). The full-sized version of the second photo appeared on the internet only in January 2015. I came to this conclusion based on results from reverse image search and based on Bellingcat’s website, which mentioned this photo only in January 2015. There are a number of areas in these “Paris Match” photos that suggest they are a product of a photo manipulation software like Photoshop. Take a close look at them (open their higher resolution versions by clicking on Picture 2 if necessary). The first impression is that they look “strange,” they look unlike any normal photos or even stills from a low resolution video. Compare the back of the truck’s white cabin with the Buk vehicle (these areas are marked in Picture 3). The back of the cabin looks sharp, as if it was taken from an excellent quality, high resolution source, while Buk looks fuzzy everywhere you look. No effects like motion blur or camera’s low resolution can explain this difference in picture quality. The cabin’s picture quality should be just as bad as Buk’s or Buk’s quality should be as good as cabin’s. You can see this startling difference in picture quality between the Buk vehicle and the truck’s cabin in both photos. Picture 3The area marked orange has significant difference in picture quality in comparison to the one marked blue. There is a night and day difference between the cabin’s edge and Buk’s edge in terms of their sharpness in the first “Paris Match” photo (Picture 4). Buk’s edge is fuzzy. It almost blends with the background. Picture 4A comparison of picture quality of cabin’s edge with Buk’s edge in the first Paris Match photo. In the first “Paris Match” photo, it is incredible how you can clearly see the telephone number, how sharp the back of the cabin looks, but how at the same time, you can barely see even the shape of Buk’s wheels on this normal day (Picture 5). Picture 5A part of the first “Paris Match” photo showing the area of Buk’s wheels. Another area that doesn’t look possible without the use of tools like Photoshop (Picture 6). Picture 6A part from the second “Paris Match” photo. The reflection from the car’s dashboard is not the same in both photos (Picture 7). The area inside the orange box should have the same black patches that are visible in the second photo. Picture 7A comparison of dashboard reflection between the two “Paris Match” photos. The full-sized version of the second photo was not published for 6 months, Paris Match initially wrote that the first photo is from Snizhne rather than Donetsk, and the story is suspicious: Someone is driving in Donetsk city on July 17 at around 11:00 on a car. He takes photos of impossible picture quality, showing a part of a car (visible in the first “Paris Match” photo), truck and Buk, parked almost in the middle of a large city. He then sends these photos exclusively to a French magazine named Paris Match, all while there is not a single other known picture or video material of a Buk vehicle inside Donetsk city made by anybody else since the beginning of the conflict. The author of these photos is anonymous, which means that we can’t easily contact him and get answers to questions like: What camera model was used to capture the photos? At exactly what time the photos were made? Can he provide other photos or videos from the same camera to compare their picture quality with the PM photos? Where is he from? Why did he send these photos exclusively to a French magazine named Paris Match? How approximately such images can be photoshopped? Suppose that we want to make the second Paris Match photo. First, we need a photo of a Buk at a suitable angle. I will use a still from a low resolution video from the internet (Picture 8), because it is all that I could find at this angle. It shows the other side of a Buk, but for this example, it doesn’t matter. I also rotated the photo horizontally. Picture 8A photo of a Buk vehicle transported on a truck. Then suppose that we want to make it look like a Buk vehicle that belongs to Russia. In order to achieve this, we need to find a photo of a Russian Buk at a suitable angle. We’ll use the following photo (Picture 9), which is a still from a video uploaded to the internet at the end of June 2014. Picture 9A screenshot of a Russian Buk “3×2” from a video uploaded to the internet at the end of June 2014. Picture 10 shows how it is possible to blur the Buk’s number (1), take a label from another Buk (3), and even take other parts, distort and warp them (2, 4). Picture 10A picture showing how it is possible to take some parts of one Buk and put them on another with Photoshop. You might be wondering why we need two Buk photos. The answer is, you can’t see the back of the Russian Buk in Picture 9. And if in the new photo you want the Buk to have the same “fingerprints” as that Russian Buk and at the same time, you want the photo to show its back, you need to use another photo of a Buk that has this part. If necessary and if we have suitable photos, we can replace the background, the truck, and add all sorts of effects (Picture 11). In the above image, I’ve tried to repeat some of the effects that we see in the second Paris Match photo. If you look at a higher resolution version of the photo by clicking it, you will notice that, for example, it has similar blocky structure where the missiles are located, as well as in some other places, just like we see in the second Paris Match photo. And just like in Picture 10, Buk here is a mix of two Buk photos: I used the Buk in Picture 8 as a base, but I copied the labels and half of the side skirt from Buk in Picture 9. I also changed the side skirt’s color and adjusted it. One reason to blur, create these blocky structures, and obscure certain areas with effects like car’s dashboard reflection or something else is to attempt to hide the traces of manipulation from the eye, to make it less obvious, to make an excuse that the photo “doesn’t look right” because it just has bad picture quality. And if, for example, we have heavily edited the Buk and degraded its picture quality with the mentioned effects, we would need to degrade the picture quality of the background image, too, or our whole image will look ridiculous, to the point that probably even the Paris Match staff would be embarrassed to use the image in an article. In order to make an image more similar to the second Paris Match photo, I would need to know the combination of effects that the author used, as well as to have the same photos that he used, and probably learn a lot more Photoshop. One thing to me is for sure: the Paris Match photos were made by a Photoshop professional (unlike Picture 11 made by me) with experience in faking photos of this type and him having access to a number of photos (of a Volvo truck, two Buks, background image, etc.). Picture 12A photo from the social media made in Torez showing Buk vehicle on a truck at a distance. Picture 13From left-to-right: a car, UAZ, and a Buk on a truck. Picture 14A photo at the same place where the Torez photo was made. Author: Max van der Werff. The place where these photos (Picture 12, 14) were taken at is a gas station (Picture 15). Picture 15A photo of a gas station (right), where the photographer of the Torez photo was standing at. Author: Max van der Werff. I added another Buk vehicle (Picture 16). Picture 16Torez photo with another Buk vehicle added with Photoshop. Russia’s newest Armata tank (Picture 17). Picture 17Torez photo with a photoshopped Armata tank T-14. Picture 18Torez photo with a photoshopped “Yars” ICBM. I used the following photos of vehicles (Picture 19). Picture 19Original photos that were used to photoshop Pictures 16, 17, and 18. Picture 20A screenshot from a weather website, showing the weather in Torez on July 17, 2014 at 12:00 as being mostly cloudy. Picture 21A photo uploaded to Twitter on July 17, 2014 by an account named GirkinGirkin. The first thing that catches the eye is the uploaded photo’s small resolution of just 337 by 600 pixels. Even typical mobile phones equipped with a camera and designed almost a decade before this photo was uploaded have a camera resolution of at least 640×480 (0.3 megapixels). And the resolution of 337×600 is not standard. This means that the original photo was either resized or cropped. There’s plenty of room left on a typical screen when viewing the photo. Why was the photo resized or cropped to such a small size? Just like in the Torez photo, Buk is at a significant distance and has even fewer pixels for us analyze. If we zoom in, we see that the height of one Buk missile is practically a single pixel (Picture 22). It is hard to even tell the number of missiles (3 or 4 or whether they are missiles). Not to mention the ease with which such detail can be manipulated in this case. Picture 22A zoomed in Snizhne photo showing vehicle similar to Buk. The process of downsizing photos reduces the pixel count used by objects in the photo. Together with artificial noise, this process can be used to conceal some of object’s details. Most importantly, if something was added to the photo with Photoshop and had flaws visible to the naked eye like in the “Paris Match” photos, resizing it to a smaller size may either hide the flaws or make them less obvious. For example, if you downsize the first “Paris Match” photo and zoom in, you won’t see most of its problems mentioned in the section dedicated to the photo (Picture 23). Picture 23A resized and then zoomed-in Paris Match photo. Picture 24 shows the Buk zoomed in and a satellite photo of the road it is travelling on. Notice how Buk is not moving parallel to the road. It looks as if it is about to hit a curbstone to its left. Picture 24Top: part of a zoomed-in Snizhne photo. Bottom: satellite image of the same road. It is possible to photoshop such photos (Picture 25). Picture 25A photoshopped Snizhne photo with an added “Topol-M” ICBM. The UK-based website of investigative journalists named “Bellingcat” uses the Paris Match photos as evidence to prove not only that the truck and Buk were deep inside the Donetsk city (the rebel’s stronghold) on the day when MH17 was shot down, but also that the Buk is from Russia. On September 8, 2014, just a day before the Dutch were to publish the preliminary report into MH17 crash saying that the plane crashed due to it being hit by “high-energy objects,” rather than due to a technical failure, Bellingcat released an article named “Images Show the Buk that Downed Flight MH17, Inside Russia, Controlled by Russian Troops.” The official report, published a day later, did not even say whether it was “air-to-air” missile or “ground-to-air.” Both types of missiles release “high-energy objects” close to the target. However, Bellingcat already claimed it was Buk, and more specifically, a Russian Buk that shot it down. What did Bellingcat use in the article as the main proof that it is a Russian Buk? They used the labels shown on Picture 26, which are present on some Buk vehicles used only by the Russian military (which the “incompetent” Russian military, of course, forgot to remove when “moving the Buk to Ukraine”) and labels, which are also present at similar positions on the Buk of Donetsk “Paris Match” photos. Picture 26An image from Bellingcat’s September 8, 2014 article, which compares Buk’s markings in one photo (Paris Match) with Buk’s markings in another (Russian Buk “3×2”). The mentioned Bellingcat’s article was actually written by a guest author named Iggy Ostanin (@magnitsky), living in UK. This combination of labels on Buk is not the only evidence that tells Bellingcat that there was a Russian Buk in Ukraine. Perhaps after comments made by people saying that these labels could have been added (with a real paint, not with Photoshop), on September 20, 2014, Bellingcat published another article named “Crowdsourced Investigation – Was the MH17 Linked Buk Sighted in Ukraine and Russia Unique?” This time the main man behind Bellingcat, Eliot Higgins, asked the internet to give him ideas how to verify “the claims made by Bellingcat that the Buk missile launcher that was used to down MH17 came from Russia.” The popularity of his article and the amount of responses from the internet was overwhelming. He got three comments. The first two were trivial, but the third one was on target (Picture 27). The commenter named “Mark Brown” refers to a Buk filmed in Russia, which is shown on Picture 9 and on the left side of Picture 26, as Buk “3*2,” because the number between 3 and 2 on that Buk is unclear. The “3*2 video” is just the video from which this photo of Buk “3*2” was taken. Picture 29An image taken from Bellingcat’s November 8, 2014 article, where the Buk’s side skirt from the Paris Match photo is compared with the Russian Buk’s (“3×2”) side skirt. In his comment, “Mark Brown” emphasized twice: “it would be impossible to create this same kind of damage to the track side skirt.” Impossible? Maybe in the world without software like Photoshop and where “Paris Match” photos do not exhibit clear signs of photo manipulation. I showed how it is possible to take the side skirt from the Russian Buk “3*2” and put it into another photo of a Buk using Photoshop on Picture 10 and 11. Notice how the left half of Buk’s side skirt on Picture 11 looks similar to the one in the second Paris Match photo. Picture 30An image showing how it is possible to take a side skirt from a photo of a Russian Buk “3×2” and make a similar side skirt shape (and labels) seen in both Paris Match photos just by mostly distorting and warping it with Photoshop. After forming the required shape of the side skirt, you can change its color; adjust, blur, and sharpen areas; add dirt, glass and other effects. As you see, it wasn’t the “Bellingcat team” that found the photo of a Russian Buk “3×2,” nor it was them who figured out to compare the Buk’s side skirts. It looks like they were fed with this information by at least two people: “Mark Brown” and the mentioned guest writer “magnitsky.” In fact, Bellingcat’s tweet about the crowdsourced investigation and the relative article looks to me like a spectacle: there is practically no people participating in this “crowdsourced investigation” on neither Twitter, nor the article’s comment section, except for one man named “Mark Brown,” who left his messages the next day and who already “solved the crime” in mid-August, 2014. Picture 31A tweet from “Mark Brown” to Bellingcat. Picture 32“Mark Brown’s” retweet of BBC Ukraine. Picture 33“Mark Brown’s” Twitter account information and background image. Even though his post history gets filled, without exaggeration, with thousands of retweets every month, with the help of Twitter search engines and certain search parameters you can get to his personal posts. After viewing a small portion of his tweets, I got the impression that he’s some sort of a pro-Ukraine, anti-Russia “info-warrior” straight from i-army.org with the rank of at least a Lieutenant General. Based on his full-text comments (like shown on Picture 27), he doesn’t seem to be a native English speaker. He also wrote “RF” instead of “Russia,” which I often see Russia being referred as in Ukrainian and Russian text (RF is “РФ” in Russian; it stands for Russian Federation). When taking everything into account, perhaps “Mark Brown” has more links with Ukraine than he’s publicly advertising? Bellingcat uses the previously mentioned Torez and Snizhne photos as proof that this “Russian Buk” was moved from Donetsk city (Paris Match photos) to Torez and then to Snizhne on the day when MH17 was shot down. Bellingcat doesn’t care whether the photos are real or fake, as long as they fit his sponsor’s narrative. They see the labels and that the Buk in the Paris Match photos has a side skirt that matches the one in the photo of a Russian Buk “3×2.” They see that the photo’s background matches the area inside Donetsk city. And they come to a conclusion that a Russian Buk “3×2” was in Donetsk city on July 17. Never mind that the Paris Match photos themselves look “incredible” and are fake. Picture 34A text snippet from CORRECT!V’s article. German mainstream media like Spiegel (Picture 35) uses CORRECT!V’s “investigation,” which in turn uses Bellingcat’s “investigation,” which concluded that a Russian Buk “3×2” was in Donetsk city because of the Paris Match photo. Picture 35A screenshot from Spiegel’s site. The text mentions Russian Buk “3×2” and shows Paris Match photo. 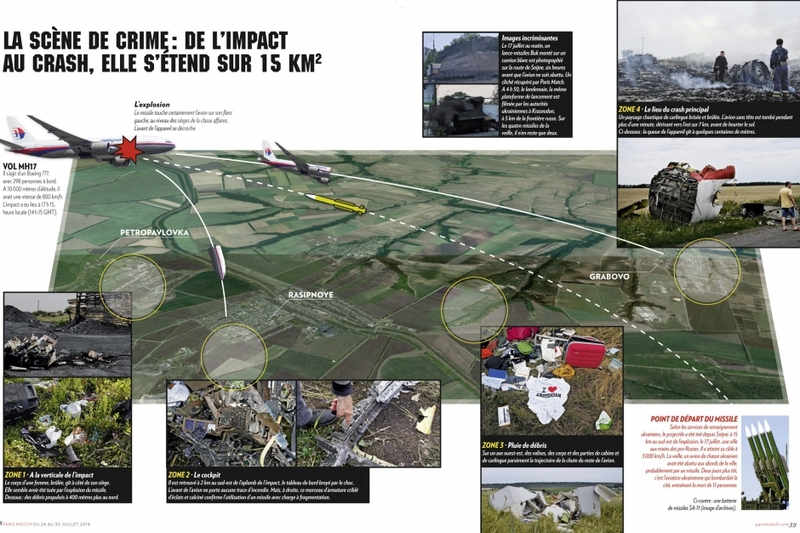 If you search the internet for terms like “bellingcat mh17 3×2,” you will get results showing how the Western mainstream media uses Bellingcat’s work about Buk “3×2” (Paris Match photos) as proof that Russia is the culprit (Picture 36). The official Joint Investigation Team, which investigates into who took down MH17 (as opposed to another team, which investigates what took it down) and which consists of members from the Netherlands, Australia, Belgium, Ukraine, and Malaysia (Malaysia was only “allowed” to join the team in late 2014), shows the Paris Match photo on its website (Picture 37). In mid-October 2015, the direct link to the JIT’s page that I used in the article stopped working. They moved the content to a slightly different address. You can also find the copy of the JIT’s page in the “Internet Archive.” And a screenshot of the whole page is in this image file. They also use the Paris Match, Torez, and Snizhne photos in their “call for witnesses” video (Picture 38), where they are interested only in people who saw the Buk, but for more than a year, they completely ignore witnesses who saw the military jets in the sky at the time of MH17 incident (Kiev denies there were any sorties that day). Picture 38Paris Match, Torez, and Snizhne photos are shown in the official investigation team’s video. This Joint Investigation Team (JIT) would be the one providing evidence to a UN tribunal had the UN vote in July 2015 been successful. And this would happen before the other official investigation team even announced whether it was Buk or an “air-to-air” missile that shot down MH17. Since the official investigation (JIT) is using fake Paris Match photo in their video and on their website, what kind of transparent, impartial, comprehensive investigation are we talking about? Is there any surprise why Russia vetoed the vote to create the tribunal? Both choices had negative outcome for Russia (note that UN tribunal is not the same as the UN investigation), but since Russia probably is aware of the foul play and since this is a criminal case, not a crime against humanity, she only had one choice. Predictably, Western mainstream media used Russia’s veto as an “admission of guilt” (Picture 39). Picture 39A screenshot from Forbes article. Other than the Paris Match photos, no other known photo or video of alleged rebel’s Buk shows enough details to come to a conclusion that in those videos the Buk is from Russia, rather than Ukraine. Picture 40A diagram of this article’s summary. The Paris Match photos, whose author is anonymous, look unlike any real photos or stills from a video: the back of the truck’s white cabin and the telephone number are sharp and are of high picture quality, but at the same time, in one of the photos, you can’t even see the shape of Buk’s wheels, Buk is of low picture quality and fuzzy everywhere you look. The dashboard reflection is not identical in both photos. They were made by a Photoshop professional from a combination of photos: photo of a truck, a background photo showing the area inside Donetsk city, a still from a video of a Russian Buk “3×2,” which was uploaded to the internet in June 2014, and other photos. The photo manipulator’s plan was to create “evidence” showing that Buk was deep inside Eastern Ukrainian rebel’s stronghold, the Donetsk city, and that this Buk was specifically from the Russian Federation and was not one of the 60 Buk launchers that Ukraine has in the arsenal. He did this by copying the Buks labels and side skirt from the publicly available photo of the Russian Buk “3×2” and using them in his photos. The photographer of the Torez photo made it while lying or kneeling in some unnatural position, most likely to show as much grass between the photographer and the road (to hide as much road as possible), to create a background image to which it would be easy to add vehicles from other photos. Even though the photo itself is of relatively high resolution, the Buk, truck, and UAZ are located at a significant distance, and they could have been easily added with Photoshop. The photo was allegedly taken around 12:00 or later and shows a bright sunny day, but on the day when it was allegedly taken (July 17, 2014), the weather at this time in Torez was mostly cloudy. Snizhne photo is of low picture quality, of a low and non-standard resolution and was resized or cropped. The Buk is at significant distance and takes up a relatively small amount of pixels. These facts, and the way the Buk looks as if it is about to hit a curbstone, suggest that it could have been easily photoshopped. A self-proclaimed investigative-journalist named Eliot Higgins (Bellingcat) uses the Paris Match photo to prove that a Russian Buk “3×2” was in Ukraine because of the Buk’s labels and side skirt. The idea to compare the side skirt came from someone nicknamed “Mark Brown,” whose Twitter account and posts show that he has links to Ukraine. The Western mainstream media in turn uses Bellingcat’s work regarding the fake Paris Match photo as proof that Russia sent a Buk to Ukraine. The official Joint Investigation Team has the Paris Match photo on the team’s site. They also showed it in their “call for witness” video, released in 2015, along with Torez and Snizhne photos. Since they “don’t see” anything wrong with the Paris Match photos, this means that the official investigation is not objective. Thanks to Gabriele Wolff for pointing out the weather inconsistency in Torez photo and pointing out who told Bellingcat to compare Buk’s side skirt. Thanks to a German engineer, who pointed out that the reflections in both PM photos do not match, that the photographer of the Torez photo was almost in a lying position, and that Buk in Snizhne photo looks as if it is about to hit a curbstone. I recommend reading Michael Kobs’ report, which showed other flaws in the Paris Match photos (section in his PDF: “A second look at the Paris Match photos”).